Slightly worn and corroded silver Denarius of Hadrian; Rome mint; AD 134-138; GERMANIA reverse type; RIC no. 303. Measures 18.8mm in diameter and 2.3mm thick. No weight recorded. Current location of find: With finder. 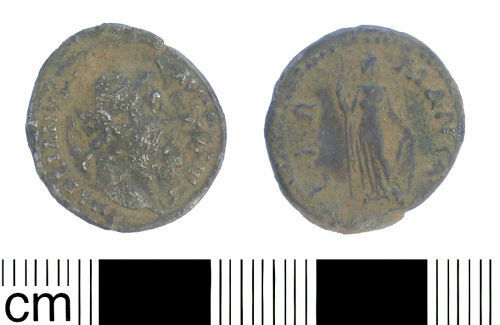 Reverse description: Germania standing right, holding spear and leaning on shield. A silver denarius of Hadrian, c.134-138. HADRIANVS AVG COS III PP obverse, GER/MANIA reverse. As RIC V.II, p375 no. 303.